Twenty Crowborough Councillors from all three tiers of local government (County, District and Town) have signed an open letter expressing their anger over Wealden District Council’s plan to approve planning permission on a new site in Crowborough. The proposed development by Catesby Estates will see up to 100 houses built to the North of Walshes Road. The detailed designs of the 160 houses on the across the road on Walsh Manor Farm were approved by the Planning Committee just a couple of weeks ago. Crowborough Councillors from all three tiers of local government recently gathered to discuss our joint response as part of the Local Plan consultation. We the undersigned are utterly shocked to learn that Wealden District Council have scheduled the Catesby proposed development WD/2017/0615/MAO (Land north of Walshes Road, Crowborough, TN6 3RE for 100 houses) which is recommended for approval, to be heard by Planning Committee North on August 23rd. This is a hostile planning application which was previously outside the Crowborough development boundary until recent weeks when that boundary was moved, without consultation with any local Councillors. We cannot understand how this can happen when the plan currently has very limited status legally and these development boundaries, which we intend to challenge, may be changed by the Inspector. It cannot be right that Wealden District Council are now looking to approve this development before the consultation has finished, and that it has been scheduled to be heard by Planning Committee North even before the consultation has begun! In the absence of any chance for local residents and Councillors to have had input into the new development boundaries such a hasty approach smacks of desperation and looks undemocratic. We most strongly urge you to reconsider, and request that neither this, nor any application outside of the March 2017 proposed development boundary, are considered for approval prior to the Inspector completing their review and the final Local Plan is agreed by Full Council. The letter is signed by both of the East Sussex County Councillors for Crowborough, six of the Wealden District Councillors for Crowborough (including Cllr Kay Moss who is taking over from recently sacked Cllr Greg Rose as the new Chairman of the Overview and Scrutiny Committee), and 15 Crowborough Town Councillors. 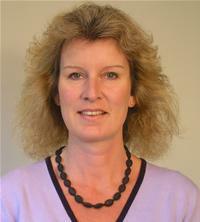 Some Councillors represent Crowborough on both the Town and District Councils. Of those who have signed the letter 12 are Conservative, seven independent and one undeclared. Councillor Greg Rose resigned from the Conservative Party after being sacked from an influential committee after speaking-out about the issue at Full Council on the 18th July. 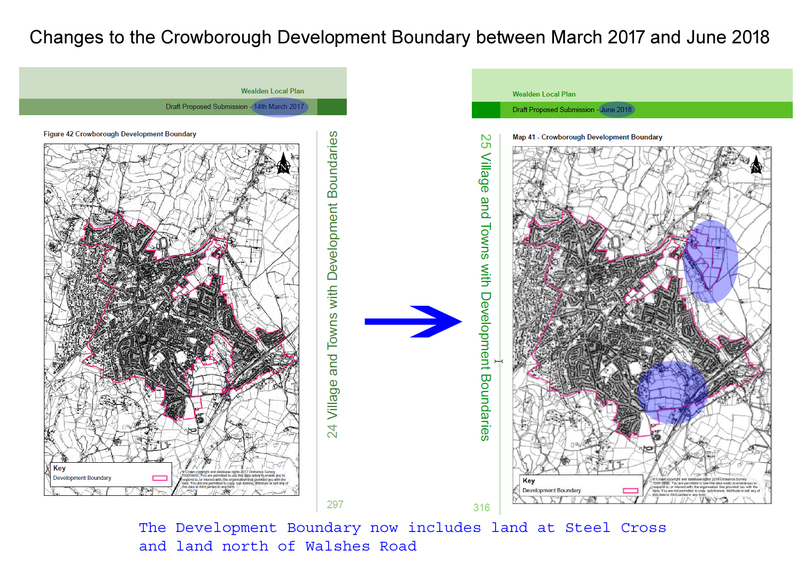 The Development Boundary for Crowborough was changed in the new Local Plan to include the site in question, as well to allow additional windfall development on land at Steel Cross. This is the first time in many a years that local Councillors for Crowborough, from all tiers of Local Government, have put their political differences aside to tell Wealden this simply isn’t acceptable. This planning application is being recommended for approval by Wealden Officers based on the new proposed development boundaries which form part of the draft Local Plan. However this hasn’t even gone through consultation yet! This is undemocratic and smacks of desperation by Wealden. The south of Crowborough has already seen 220 new houses approved which haven’t been built yet, and therefore the impact on the road system is unknown. Wealden are now saying that an additional 100 houses are acceptable. The fact they are trying to push this through at Planning Committee North on 23rd August, before the consultation on the Local Plan has been completed is just wrong. In fact this application had been prepared and was scheduled to go to committee even before the consultation had begun! If Wealden District Council and Catesby Estates proceed in this manner, ignoring elected Councillors requests for a postponement until the new Local Plan is approved, then this will show all residents of Wealden that the District Council will do whatever it wants, with no concern and without listening to those it effects most. The outline planning application WD/2017/0615/MAO (Land north of Walshes Road, Crowborough for 100 houses) is not regarded as hostile to the Council’s position. It lies within the newly defined development boundary as set out in the Proposed Submission Wealden Local Plan. The application has been subject to a significant public consultation exercise and the range of objections from within the community will be presented to the Council’s PCN Sub Committee on Thursday 23rd August. By referencing the recently published Wealden Local Plan (August 2018) it will strengthen the Council’s position to defend against other inappropriate developments outside the development boundary. The Crowborough development boundary has been subject to careful consideration through the sustainability appraisal process, including consideration of the Ashdown Forest issues and AONB. Failure to respond positively and in a timely manner to suitable application sites will lead to difficulty to defend appeals. The suggestion that the application should be deferred until after the Examination in Public (possibly spring 2019) would likely lead to an immediate appeal by the applicant. Wealden District Councillors had an opportunity to comment on the details of the Local Plan, including development boundaries, at 8 separate meetings between May and July. A significant majority of Crowborough Councillors voted in favour of the Wealden Local Plan at Full Council on 18 July. 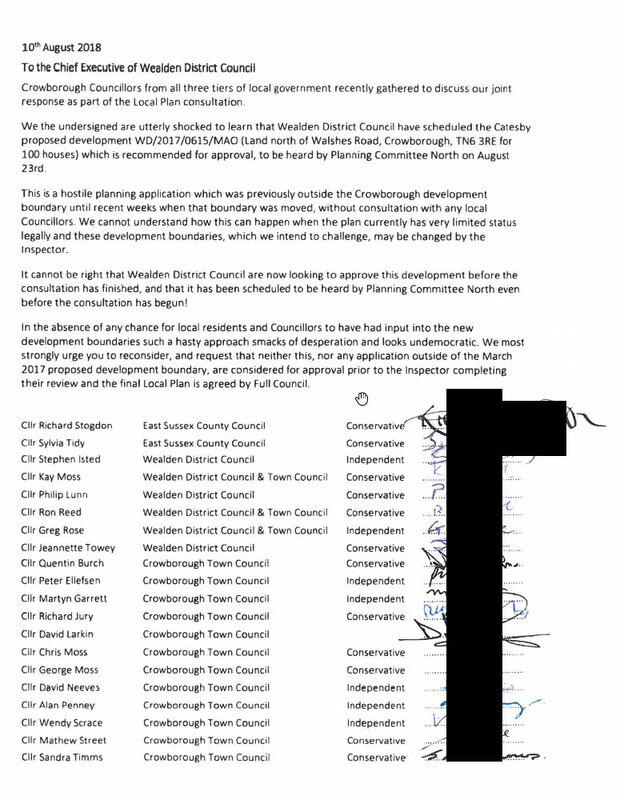 It is believed that the Crowborough Councillors who have signed the note may have misunderstood the Local Plan process. It should be noted that the Local Plan is currently out for representations. It is not a consultation, in that comments will be assessed by the Council but that any representations are for the Planning Inspector to assess at the EIP. The public can give their views on the new Local plan via the Council’s Consultation Portal from Monday (13th August) until the 8th October 2018. Hard copies of the Local Plan and associated documents can be viewed at the Crowborough Town Hall and Crowborough Library. Click to download a map showing the Crowborough Development Boundary. Who are the Councillor members of the Local Plan Sub- Committee who provided the input leading to proposals and why! Does the proposal now meet their comments. Don’t blame the officers they only advise, and in some cases may feel under pressure from certain Councillor members or others. Is the officer’s report based on Council’s stated policy or on Government Policy statements / guidance ignoring local views? Councillors should be able to answer that question. In addition to Anita Grose’s comments, I’d add pressure on: primary schools, as well as Beacon Academy. doctors, dentists and other healthcare centres, commuters from Crowborough station, town centre car parking, local bus routes (assuming there are any buses by the time these 220 houses have been built), all roads in town, most of which were built for horses and carts, and quality of life for both current and future residents. We desperately need affordable and public rented housing, but it always seems that Wealden has the wrong priorities, rides roughshod over local democracy and doesn’t think things through. Had ALL our local representatives shown such unity of purpose a few months ago, then we may not now be lumbered with a hideous development at Mead House/Pine Grove and the loss of 99 public car parking spaces with serious financial consequences for our splendid Community Centre. At last, they seem to be realising that Wealden District Council has an anti-Crowborough agenda.